We got lost trying to find Tree, and no wonder – the signage is way above eye level on the pillar next to the establishment’s black-matted front, and the windows are so small you wouldn’t realise a restaurant and bar reside within. There are two entrances to the establishment – it’s the red door you want to open for the bar. Tree nestles on the second floor of this restored three-storey shophouse, built in the early 1800s. Part of the Jackson Plan of 1822, this building holds more history than its 5ft walkway could take. These dimensions are not limited to the front of the buildings, though: even the stairs leading up the bar felt uncannily similar in length. 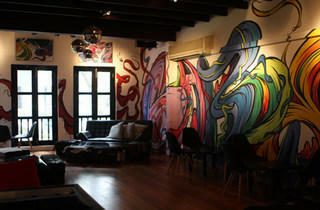 We were guided by the colourful graffiti that adorns the side wall and act as a railing to the bar. The parquet flooring was littered with plush, sporadically positioned three-seater couches, single-sitting sofas and chairs. 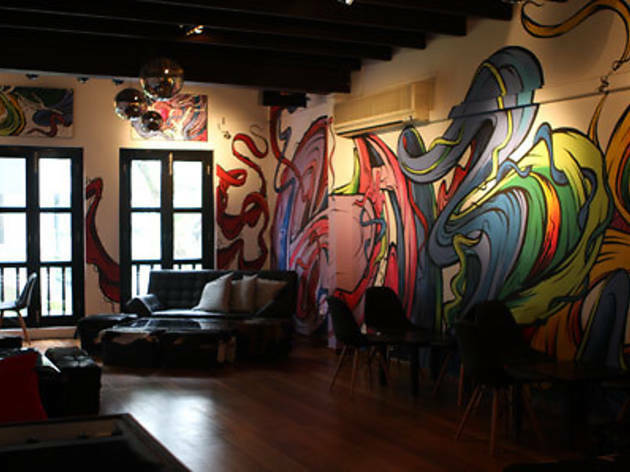 Graffiti murals by English artist Mister Batlow – who designed for Levi’s and Louis Vuitton – extend from the side wall of the staircase and swirl around the walls of the bar in a blaze of colour. The overall feel is both abstract and minimalist: candles challenging the dimly lit space, an artistically melted but functioning lamp on the wall, trip hop and jazz. It feels like a space where artists like Damien Hirst, Banksy and the father of molecular gastronomy, Hervé This, would hang out. The attention to detail at this experimental, progressive bar – from its secluded location to its decor and molecular cocktails – was why we couldn’t hide how impressed we were. It’s ambitious, as is its owner/chef. Twenty-eight-year-old Tim Ross-Watson embarked on his culinary journey at the age of 16; this is his first solo venture. He serves nine cocktails ($19-$24), all original recipes. The Black Stuff ($22): served in what looks like a vintage coffeeshop mug, is Ross-Watson’s interpretation of our much-loved Guinness. Tia Maria, espresso and chocolate bitters give it the caffeine kick, while vanilla bourbon and vodka give it a sweeter, stronger flavour. The signature heady froth is made of two egg whites, shaken. Both vodka and espresso lingered on our palate, tasting exactly like the Irish dry stout. The chaotic Adam and Eve ($20) is what you get when an alchemist gets thirsty. Home-made vanilla-infused bourbon is poured in a glass, where dry ice soaked in apple juice awaits. Clouds of fumes that we’re instructed to take in through the nose billow from the glass. The apple-scented fumes from the dry ice opened up the flavours of the vanilla bourbon. We gasped, but also loved the interactive element. All this excitement made us hungry for the five bar snacks ($8-$28). We tore open the paper bag to get to the crunchy but light deep-fried pork scratchings ($8), which crackled like Pop Rocks in our mouth; no one cared about the accompanying yoghurt dip. The Micro Beef Slider ($28) – Wagyu beef topped with foie gras – was well-seared and tantalising, but did nothing more than fill us up. The selection of boutique beers (MOA Beers’ St Joseph and Imperial Stout, $20; Napoleone & Co Pear Cider, $12; and Asahi Premium, $15 to name a few) were favourable complements to the bar grub.